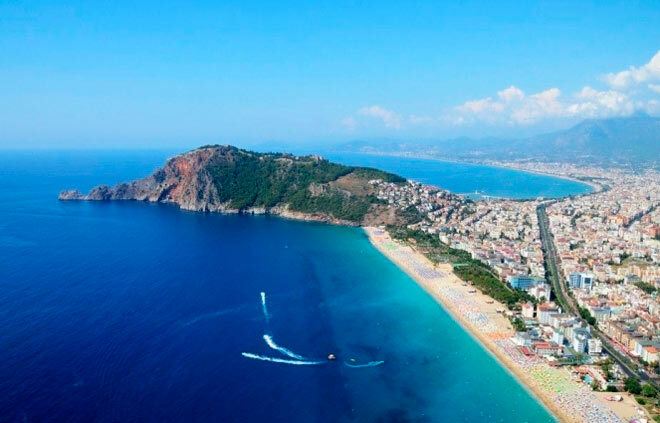 This is one of the best beaches in Turkey got its name from a legend. It is said that Cleopatra once received this beautiful stretch of land as a gift from Mark Antony. Now this place — a beautiful beach, stretching for more than 20 kilometers, which is suitable for relaxation and couples and noisy companies. On the beach of Cleopatra everyone can find a place for the soul. Infrastructure, dozens of shops, hotels and entertainment complexes will not leave anyone indifferent. It’s nice impressive and excellent service. On the coastline you can find and pay the beaches, and the so-called «wild beaches» where you can relax without spending anything. The entire surface is covered with yellow Cleopatra beach of fine sand. In some places there are small pebbles, mainly close to the sea front. Log into the water in different places different, so in the middle of the beach, very sharp transition to the depth.